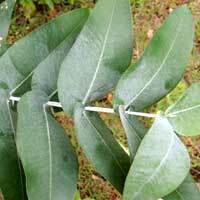 Leaves on young trees are broadly elyptic to orbicular and ashy gray-green with stem-clasping bases. 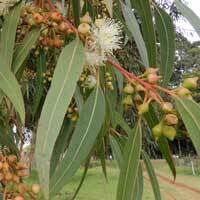 Small, fast growing gum tree. 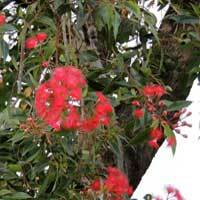 The bright red flowers distinguish this from the many other introduced species of Australian gum trees. Bark is gray to dark gray and deeply furrowed. Leaves lance shaped. Flowers white. Non-native forest and ornamental tree widely planted in Kenyan. Almost linear leaves and spikes of snowy-white flowers. Non-native ornamental tree widely planted in Kenyan gardens. 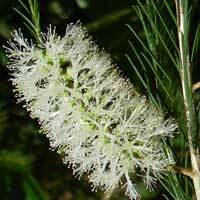 Hanging branches and long spikes of flowers with showy stamens. 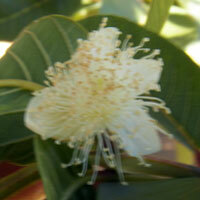 Exotic tree from Austalia with white flowers and gum-tree like fruit. Large elyptic leaves with smooth margins. Large broadly elyptical leaves. 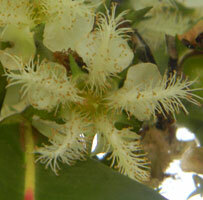 Flowers with numerous stamens. Bark smooth with patchy coloration. By no means am I an expert on the Natural History of Kenya. In fact, I am so new to exploring this part of the World, that I am quite an amature. 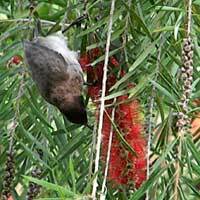 By creating a page for the species as I learn them I am teaching myself, sharing with others, and happy to receive feedback from web site visitors.